Recruiting for Good and Our Moms Work a cause and purposeful staffing company based in L.A. is sponsoring the Chocolate Party for Good Reward to thank nannies for helping Westside moms work. Our Moms Work, thanks nannies for making life better for working moms. Recruiting for Good and Our Moms Work a cause and purposeful staffing company launching in January and based in L.A. is sponsoring the Chocolate Party for Good Reward to thank nannies for helping Westside moms work. Our Moms Work, community leader and advocate, Carlos Cymerman says, "Twenty years of staffing experience has taught me that the best way to retain talent is thru appreciation. We look forward to rewarding L.A.'s best nannies our signature 'Belgian Chocolates and Melting Chair Massages' parties. Nannies, make life better for working moms." 1. The reward is for awesome nannies serving grateful moms who live in the Westside communities. 2. 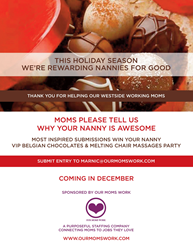 A Westside working mom sends an email to MarniC(at)OurMomsWork(dot)com to nominate a nanny. 3. The most inspiring nominations will be chosen and receive a special invitation to the chocolate party for good. Carlos Cymerman, adds, "Moms please participate and nominate your favorite nannie today; so we can make a difference in their life." Our Moms Work Partner Marni Chaikin became a mom 7 years ago while running her own business in Los Angeles; went from sole owner/operator of a single fitness franchise to owning multiple locations. Marni came across thousands of moms every month who were working, attempting to make time for themselves, their spouses, their children and find a balanced life in the workforce. Marni is passionate about making life better for moms.